Benefits of Building with Structural Insulated Panels (SIPs) The energy our homes use to keep us warm and dry actually has the potential to greatly impact the environment. About 22,000 pounds of the CO2 released into the atmosphere annually can be attributed to peoples’ homes. To reduce the environmental impact of the homes we build, Fine Line uses both energy efficient and eco-friendly building materials in our walls and roofs and superior insulating techniques for the foundation to create a sealed and highly insulated building envelope that discourages insects and resists mold. Fine Line Eco-Friendly Homes are four times more airtight than homes built with traditional building materials and save up to 50 per cent in home energy use. These energy savings directly translate into more money staying in your pocket, especially with rising energy costs. An important component of the tightly sealed envelope surrounding Fine Line Energy Efficient Homes is the use of Structural Insulated Panels (SIPs) for wall construction. Structural Insulating Panels use polystyrene sandwiched between plywood as an efficient and effective building system providing superior insulation to keep your green home in Calgary (or surrounding area) warm and dry, and help keep it air and watertight. 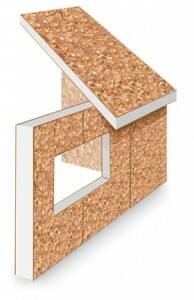 The use of SIPs in the walls of Fine Line Eco-Friendly Homes results in 50 per cent less lumber for framing. SIPs require less room at the construction site, create less of a disturbance and produces less waste. And as already mentioned they can also lower your home energy use by up to 50 per cent greatly reducing your footprint. As a building material, Structural Insulated Panels are easy to work with. They increase our building capacity and reduce the time it takes to build your new home. Occurring in materials with relatively high thermal conductivity, thermal bridging is a common cause of heat loss in homes constructed with traditional building materials. Especially in cold climates and during the winter months when temperature differences between the indoors and outdoors is greatest, thermal bridging not only provides an uninterrupted pathway for heat loss between the interior and exterior of a home, it also results in cold spots inside the walls and allows the build-up of condensation. Constructed of materials with low thermal conductivity, SIPs are engineered to minimize thermal bridging. The construction cost of SIP walls for Fine Line Energy Efficient Homes is only 1 per cent more then the total cost of a home with walls constructed of traditional building materials. Energy providers offer incentives for energy efficient homes and the use of SIPs offers the potential for a reduced mortgage rate. The energy-efficiency of SIPs will lower the long-term operating costs of your home for years to come and save you monthly on rising energy costs. An important building material for the construction of Fine Line Homes, the use of Structural Insulating Panels helps lower your construction costs, reduce the time it takes to build your home, and helps us construct a greener Calgary. What Are the Benefits of an Infill?